Patong Beach, Thailand - 29/95 Rachapathanusorn Road. Lamai Apartment has 21 deluxe rooms with air-con, hot shower, private bathroom, TV, DVD player, hair dryer, mosquito protact spray, an electronic adaptor, refrigerator, mini bar, beach towels, safey deposit box, security electronic door key card, glass windows, balcony, and free wireless internet in all rooms. Our reception service is 24 hours. Our maid servic is diary at 8. 00 a. m. - 5. 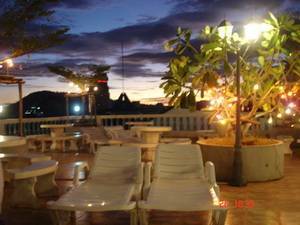 00 p. m.
Our bar and restaurant are on the 5th floor with Patong Mountain View. Patong Mountain is so beautiful. 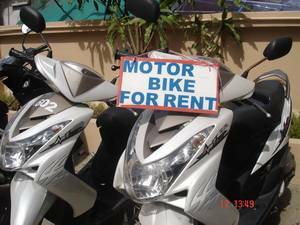 Motorbike rental, Car/Jeep rental, Bar, Restaurant, Fax, Telephone, Money exchange, Tour information, Laundry, and Taxi car. We offer the special motorbike rental for THB. 250-200 per day. There are 6 new YAMAHA automatic motorbikes. They are so easy to ride them around Phuket. We have the car/van transfer between Phuket airport to Lamai Apartment 24 hours. But we charge for THB. 700 per 1 car, and for THB. 1, 000 per 1 van. 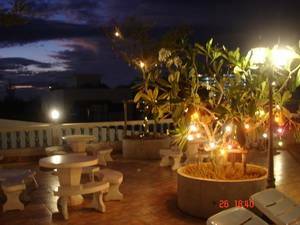 Lamai Apartment is opposit Patong Municipality Office, and near Patong Fire Station on Rachapathnusorn Road. 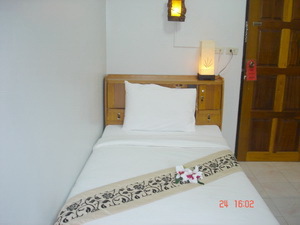 Lamai Apartment has total 21 rooms with 3 types of room. There are 15 Deluxe rooms, 3 Superior rooms, and 3 Standard room. 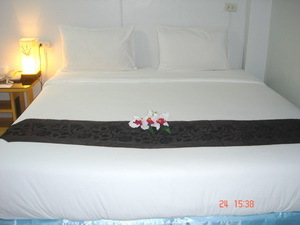 Deluxe room is size 30 sq. m., with Double bed (a king size bed, 6. 0 feet), for 1-2 people. Breakfast is not included. Superior room is size 30 sq. m., with Twin bed (2 small beds, 3. 5 feet each), for 2 people. Breakfast is not included. Standard room is size 20 sq. m., with a sigle bed (a small bed, 3. 5 feet), for 1 person only. Breakfast is not included. On the 5th floor with Patong Mountain View. Room rate is not inclued breakfast. 1. Deposit 8% of the total cost will be charged on booking date, and non-refundable. 2. Balance 92% of the total cost will pay direct to the hotel on arrival date. 3. All guest must to make the cancel reservations at least 2 days before the arrival date. 4. In case of NO SHOW, the guests have be charged for 1 night. 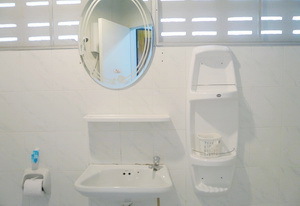 Lamai Apartment is opposit Patong Municipality Office, and near Patong Fire Station on Rachapathanusorn Road. Lamai Apartment is 16. 0km to Phuket Bus Station, 16. 5km to Phuket Pier, and 40. 0km to Phuket Airport.